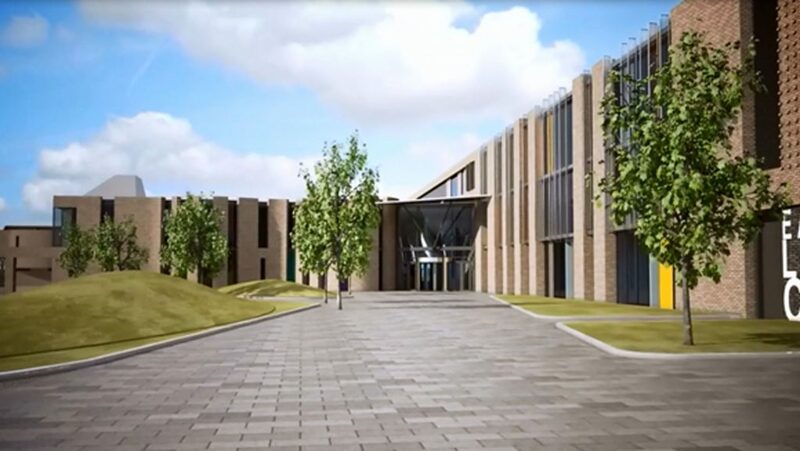 This modern, state of the art educational campus building provides new facilities for a nursery, primary and secondary school, along with a multi-use sports hall, constructed within the grounds of the existing James Hamilton Academy campus in Kilmarnock. The new facility is being constructed in a phased approach, hence on occupation, it will allow the existing academy building to be demolished, making way for the new sports fields. The design proposals for the main teaching block comprise a reinforced concrete framed structure onto traditional shallow pad foundations. Post-tensioned concrete techniques were utilised for the floor slabs to provide a slim structural zone with an exposed flat soffit, allowing an optimum floor to ceiling height with flexible services integration. Concrete blade columns were designed to be hidden within wall makeup with reinforced concrete core walls providing the stability of the structure. In the heart of the teaching block, a large atrium space has been created with the clear span roof being supported on exposed steel feature trusses. An exposed concrete floor slab, at ground floor provides an aesthetically pleasing and hard wearing surface complementary to the concrete superstructure. Centrally within this space, there is a feature pre- cast concrete Hellerup staircase, which provides vertical circulation through the building and also delivers a seating area suitable when used as an auditorium space. At the sports hall, an efficient braced steel frame structure is adopted to form the large multi purpose halls, reception space, and changing facilities.